Probably the most common disease among fish is ich. But, what do you really know about this organism? Ich is short for the name of a ciliated protozoan of the genus Ichthyophthirius. It is usually present all the time in aquaria in small numbers, just like germs are in the air we breathe. However, when a fish suffers from extreme stress, such as a sudden drop in temperature, its resistance is lowered and it becomes vulnerable to diseases. Outbreaks also occur after the introduction of new fish to an established aquarium. Ich is free-swimming until it attaches itself to the skin of a fish. Under a microscope, the organism is easily seen and identified, even under low magnification. It looks like a round, rolling mass. According to John Gratsbek, et al, in the book Aquariology, The Science of Fish Health Management (Tetra Press), it is one of the few fish parasites completely surrounded by cilia. The organism's U-shaped nucleus is often visible under a microscope. Once the free-swimming ich reaches a fish, it attaches to the outer layer of the skin of the host fish. The ich organism then forms a tough outer shell, or cyst, while it feeds on the fish's bodily fluids. This encysted stage, called a theront, grows large enough to be seen with the naked eye. Each theront appears as a tiny white spot on the fish. Severe infestations make fish appear as if they are covered with salt. After theronts grow to a certain size, they break through the skin and drop off the fish. As they fall, they attach to the bottom or sides of the aquarium, or to plants, gravel, decorations, tubing or any other stationary object. Theronts then begin their reproductive stage, and are then called a trophozoite, also known as a trophont. The attached trophozoites then begin producing the infective, free-swimming stage. Hundreds more free-swimming ich organisms, called tomites, can arise in less than a day and a half, and they in turn re-infect the fish in your aquarium. In nature, it is not much of a problem. There are large numbers of fish to which tomites can attach. And with the greater amount of water volume, it's likely that many organisms do not even find a host. However, in a closed system like an aquarium, it re-infects the same fish over and over, resulting in severe infestations. That's why it can be such a problem. While it is encysted on the fish, no medicine can affect it. But once it's free-swimming, it can be killed. Since the life cycle takes at least three days at 80 degrees to complete, it must be treated for at least four days. I prefer to treat for a week. Ich dislikes warm water, so I immediately bring the water up to 85-88 degrees. Since warm water cannot hold as much oxygen as cool water, I also increase the aeration by adding air stones. Another reason for added aeration is that it infects the gills of fish as well as the outer skin. We only see it on the skin of fish, and assume that's what's making them so sick. 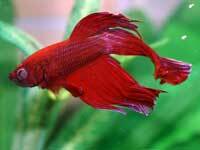 But my personal belief is that gill infestation by ich is the main cause of suffering and death in aquarium fish. I believe this damage to the delicate gill tissue suffocates fish, which either kills them outright or leads to lethal secondary infections. An increase in dissolved oxygen brought about by vigorous aeration may mean the difference in life or death to your fish. Along with a temperature change and added aeration, I usually add about one teaspoon of canning and pickling salt per gallon to the water to help the fish recover from the stress caused by the disease by reducing osmotic pressure, enabling the fish's own immune system to fight back. Salt is also harmful to it. See Aquarium Salt. Water changes are extremely important in fighting outbreaks. Using a gravel washer, I do a 50 percent water change on a daily basis. This eliminates a great number of trophozoites and tomites from the aquarium. While I prefer not to use chemicals to treat any disease, developments over the past few years have left me little choice. The ich we contend with today are particularly virulent strains because, in my opinion, so many hobbyists, and, more importantly, pet shop owners/employees, have used chemicals and antibiotics instead of good hygiene to treat disease. What I refer to as hygiene is simply hard work: i.e. water changes, heat, added aeration and salt. When that is insufficient, I use Rid-Ich, which is a commercially available medicine consisting of zinc-free malachite green and formalin. I've found this to be highly effective in treating it. If your fish recover from ich, they may not get it again. There is evidence that fish become resistant to it after they survive the initial infection, so fish which recover from an infestation should be less likely to contract the disease at a later time. However, I would still recommend a three-week quarantine period for all newly purchased fish. Items you should have on hand in fish tank emergencies!